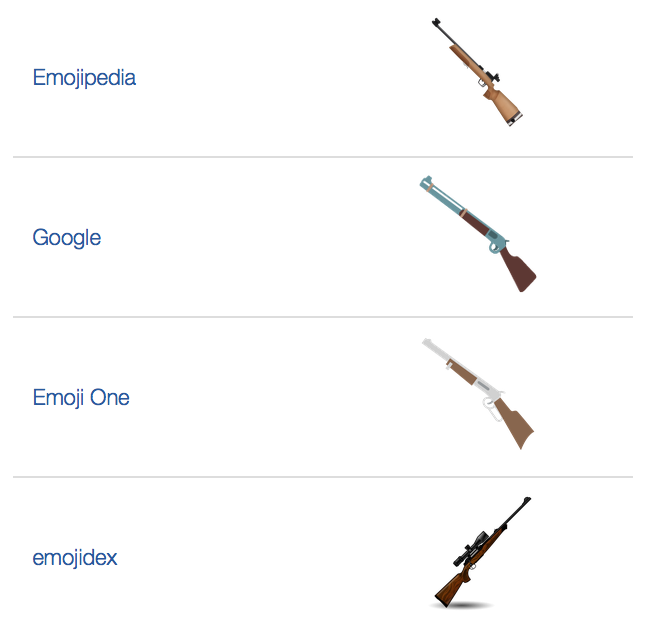 Who Made the Rifle Emoji Disappear? Unicode 9.0, which will be out June 21st, is one of the most highly anticipated releases in emoji history. Finally you will avail yourself of the need to type out the letters for avocado, bacon, selfie, face palm, and pregnant. But last month, one controversial emoji was removed from the lineup: Rifle. Surely the debut of such a emoji at this moment in time, just after the worst mass shooting in US history, was deemed incredibly insensitive and dropped from the list. But as BuzzFeed reports, the process of removing the rifle was in motion long before what happened this week. The way we “get” new emoji is a long and somewhat complicated process managed by the Unicode Consortium, an international group of representatives from technology companies. So 9.0 release “candidates” were announced in May 2015, but still needed to go through almost a year-long approval process. When that part’s complete, the release, along with the corresponding code for all the new emoji, is ready for “representation”—where each platform decides how to design the symbols to fit their own visual language. Technically, the rifle is still there—or at least the code for it still exists. According to Emojipedia, both rifle and modern pentathlon were removed last month, even though their earlier inclusion was defended because they’re used in Olympic sports. But since they were removed so late in the process, they are still on the release, they’re just not being given emoji presentation. Meaning that they automatically won’t be supported by any devices. Unicode president Mark Davis confirmed this to BuzzFeed in an email: “The committee decided not to mark them as emoji, but to add them as characters (that is, normal black & white symbols).” I reached out to Davis for additional comment. But according to an unnamed source who contacted BuzzFeed, “Apple” is responsible for removing the rifle, as the suggestion was made by someone from the company who sits on the Unicode Consortium (BuzzFeed doesn’t say whom; it could be any of these people). But the Unicode Consortium is made up of representatives who form an independent governing body, so attributing any influence to Apple is kind of like giving the US all the credit for anything that happens at the United Nations. It’s not like Apple, the company, came forward and said, we are speaking out against gun violence and we will not support this gun. But actually, people have been calling on Apple to do just that—with the other gun that it supports. Last year, New Yorkers Against Gun Violence attempted to get Apple to stop supporting the pistol emoji with a campaign called Disarm the iPhone. But the pistol remains on iOS keyboards, as do emoji for bomb, cigarette, and a menacing-looking knife—all of which have been criticised by various groups. You might think this is a silly debate, but as the Great Taco Emoji Campaign has taught us, people are very passionate about emoji. And if we want to keep making the argument that words do matter, universal symbols might matter even more when trying to communicate ideas. There’s a way that smart design can subvert this conversation. In its representation of the pistol, Microsoft—which, it should be noted, also debuted the essential middle-finger emoji long before Apple or Google—allows its users to convey the concept of a gun without conveying violence. Microsoft designed a toy gun—complete with red safety cap.